I just wanted to update you about my findings with your test file that you provided. I put your file in a Project in my FCP X and exported it out and using Mac OS 10.11.4 and X2Pro 3.0.13, the file converted without problem. I then looked and saw that you were running Mac OS 10.10.5, so I booted up in that version and tried using the same (3.0.13) X2Pro version and I got the same error message that you do on your files. We have come across a few instances lately since Apple released the 10.11.4 OS X update where the Mac OS update has fixed an issue with X2Pro conversions. Since X2Pro uses Apple applications and developer files when it runs, we can only guess that a slight change in one of those files has resolved the problem. Apple doesn’t give complete specifics of the changes In the upgrade, therefore we have no definite way of knowing what resolved the problem. If you can upgrade your OS X to the latest version, we believe things will start working better for you. Please let us know how you get along and my apologies for the delay. I have emailed you directly about getting the CANON files from you. Please check your email and get back with us. Can I get the text from your error and will you let us know what version of Mac OS and FCP X you are running. So, do you know why it's not working? Are other's having the same problem? I've updated to 3.0.13 and still getting the same error message on a completely new and different project. Will you please post some of the error messages you get so we can know specifically what messages you are still getting the same of. When you first reported to the forum, you had an invalid track layout error and the second time there was a "Failed to resolve bookmark". Is it one of those 2 errors that you are getting after doing what i suggested, or a completely different error? Also, please supply us with your FCPXML that you have used most recently. If it is multiple, please provide them all with the corresponding error message for each one. Last Edit: 3 years 1 month ago by Jeremy Norwood. I have also added the "VIDEO_Raid" drive to my X2Pro media locations in the preferences. I'm still getting the same error message. Would you please look for the media file "A005C012_1702175W_CANON" which is referenced on a drive called "VIDEO_Raid" in the "FCPX_Libraries--> Deluxe_Imagine.fcpbundle__> 2-17-16 --> Original Media folder" directory. Also, could you try adding the "VIDEO_Raid" drive to your X2Pro media locations in the preferences. Please let us know how you get along. I'm sure it's the same file, but it is strange. I've tried multiple times and even zipped it. When I upload and then download - the same file gives me this new different error message. 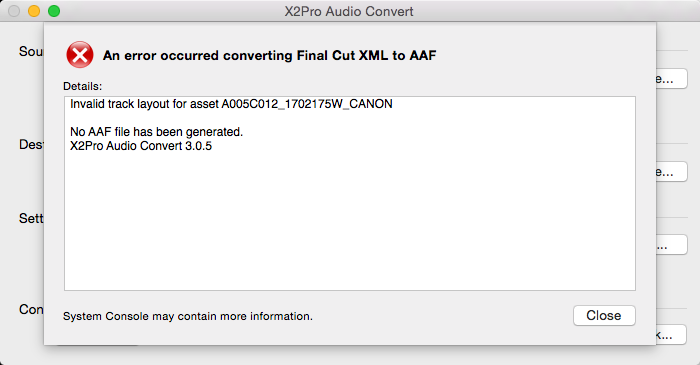 Are you sure that is the right FCPXML for the error message you attached below. I don't get the same error when I open and convert it in version 3.0.5. Is the error message shown as soon as you load the fcpxml, or after you click the "Start" button? Help, keep getting "Invalid Track Layout" on all Canon C300 Mkii projects! Using FCPX 10.2.3 and 10.2.2, OS X 10.10.5, X2Pro 3.0.5. Canon 300 Mkii footage optimized. Multicam edit. Seems related to this new Mkii footage as I haven't had the problem with C300 Mki projects.